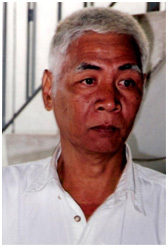 Cambodian Painter Vann Nath was one of only seven survivors of the Khmer Rouge’s infamous Toul Sleng torture center, where 14,000 people perished during the genocidal regime of Pol Pot. Called Cambodia’s Goya, his paintings in Phnom Penh’s Genocide Museum are famous worldwide. Vann Nath’s Mother and Child of the Genocide is one of the last paintings created during his genocide period (ca. 1980). Unlike his other paintings, which depict chilling scenes of violence and brutality, Mother and Child evokes a heart-wrenching sadness for all of humanity.